In compliance with the General Data Protection Regulation (GDPR), Disqus provides users with options to access and fully delete all of the data associated with their accounts. Use the guide below to understand what type of user you are on Disqus and how to request access or deletion in each circumstance. Note: If your website uses Disqus, visit Update on Privacy and GDPR Compliance for more information. 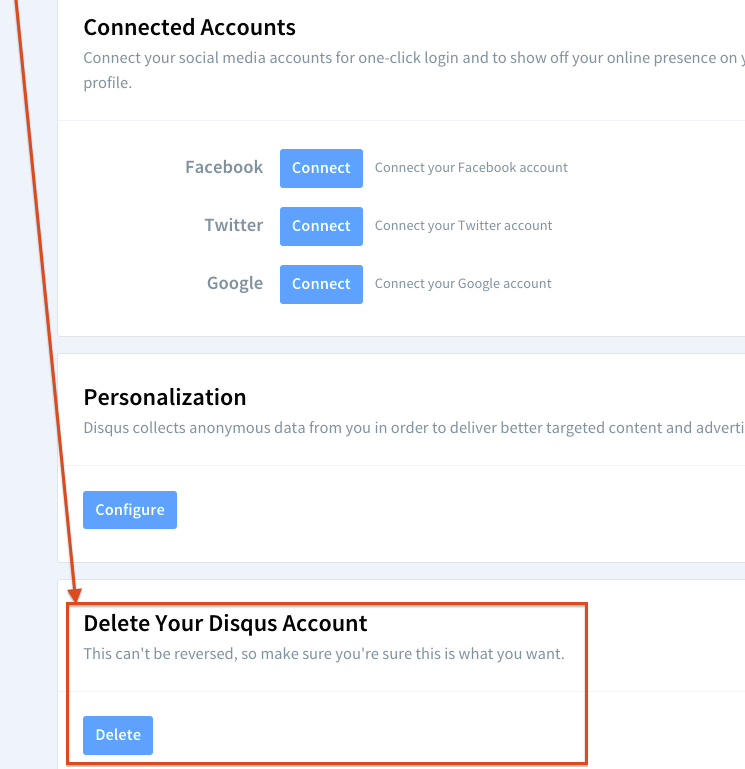 If you own a registered Disqus account, you can use the self-serve deletion feature in Settings > Account > Delete Your Disqus Account. See How to Delete Your Account and How to Request Data Access below for more instructions. If you can no longer log in to a registered account that you suspect you owned in the past, reset your password by entering any email addresses that you believe may be associated with the account. After successfully resetting the password, you can now use the self-serve deletion feature in Settings > Account > Delete Your Disqus Account. See How to Delete Your Account and How to Request Data Access below for more instructions. If you have lost access to both your email account and your Disqus password, you will not be able to log in to Disqus to initiate the deletion yourself and we will do our best to assist you. See How to Delete Your Account and How to Request Data Access below for more instructions. Guest Commenters: You can unsubscribe from emails by replying to any notification with the word "unsubscribe" in response. See more ways here. You can also contact website moderators to delete your comments for you, if desired. If you would still like to delete or access your Guest Commenter data, we recommend registering a full Disqus account, then See How to Delete Your Account and How to Request Data Access below for more instructions. Site-specific Profiles: Some sites have their own login systems which integrate with Disqus. You'll know these profiles because they can only be logged into/used to comment on that particular site. Since these profiles aren't managed by Disqus, you will only be able to delete or access data through the website the profile belongs to. 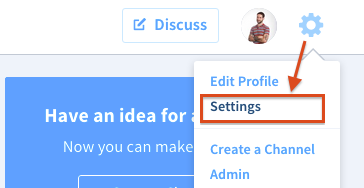 At disqus.com in the upper-right, click the gear next to your avatar and then click Settings. 2. Under the Account tab, scroll down to click the Delete button. 3. You'll then be brought to a page to confirm your account deletion. Select a reason for account deletion, and then click the "Delete my account" button to confirm deletion and queue your account to be deleted. We recommend using this method only if you can not delete your account yourself by logging in and using the instructions above. We can only delete data for people who can reasonably prove they are owners of the Disqus data in question. We will need to verify your ownership of the data by verifying your email address via an email support conversation. Copy and paste the required information below and fill out your answers. Note that incomplete requests can not be processed and we may ask for more information before we can verify your ownership of the data in question. - Are you using Disqus from a country within the European Union? We can only provide data access for people who can reasonably prove they are owners of the Disqus data in question. We will need to verify your ownership of the data by verifying your email address via an email support conversation. To submit this request, contact our support team by clicking the blue icon in the bottom right corner. Copy and paste the following required questions along with your answers. Note that incomplete requests can not be processed and we may ask for more information before we can verify your ownership of the data in question. Note: Here's how to copy a direct comment link or profile url. What happens when I initiate account deletion? When you delete your account, your account will be immediately deactivated and a full deletion will be completed within 30 days. 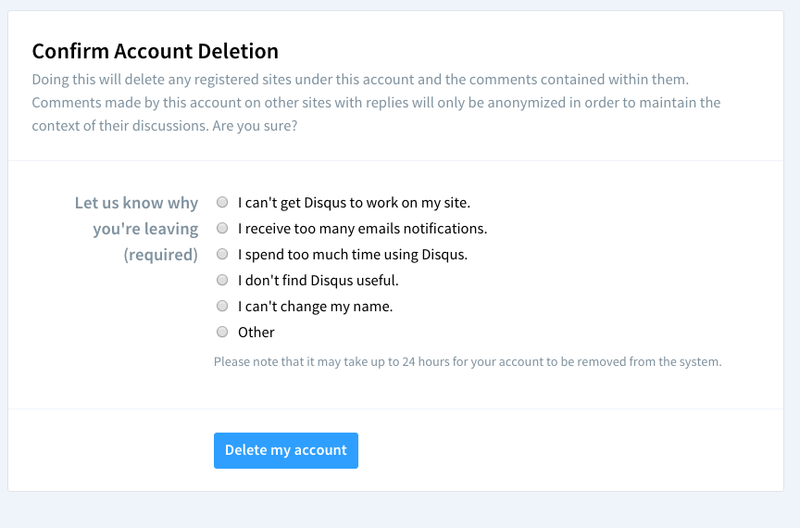 During the 30 day deactivation period, your Disqus account, including comments, will not be publicly accessible. After 30 days, your Disqus data is not recoverable.